We strongly believe this phrase. We apply it to Barry Beach but believe this about all injustices. We believe it means that when an injustice is handed down by our government and elected officials, it is wearing away at the fabric of our own Constitutional rights and endangering the freedoms that we hold dear. We believe that when an injustice is overlooked for any purpose, that is empowers those that run our government to overlook other injustices. Whatever your beliefs, thoughts or feelings about Barry Beach, this issue concerns all of us and all of our freedoms. Our Founding Fathers gave us a government that empowers the people (not the elected officials) and gave all men inalienable rights. If we allow our government to make exceptions to these rights for particular cases, we allow them to make exceptions for anything they desire. The rights the Constitution affords us are not open to perception, opinion or debate. We are not speaking about what you will watch on television tonight. We are speaking about life, liberty and the pursuit of happiness. This freedom is not given to any special class. We made this clear when we abolished slavery in the United States. It is given to all…unconditionally. Barry Beach also has rights. We believe that these rights have not been upheld in the Montana judicial system for 30 plus years. 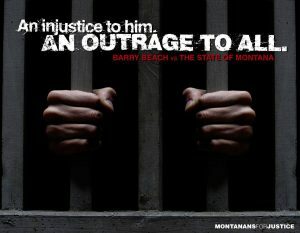 We call upon the Montana government, especially the judicial system to grant Barry Beach the rights that are due to him. The Honorable Judge E. Wayne Phillips of Fergus County, Montana, granted Barry a new trial in accordance with Montana State law. We believe this ruling was a just and fair ruling. Judge Phillips stated that he believes that had a jury of Barry’s peers heard the new evidence known today (not known at the original trial), that they never would have convicted Barry. What does the State of Montana have to lose? A conviction? If the conviction is wrong, then what is the purpose in having it? If Barry Beach is guilty, then let the evidence (all of it) speak for itself and let a jury of his peers convict him again. If he is innocent, then the evidence will point the jury in that direction. Either way, this case needs to be reheard by another jury. The State of Montana maintains that they are positive of Barry’s guilt. If they are so convinced, why do they believe that a jury would not believe the same? Is the State of Montana afraid that a jury would not find Barry guilty? First of all, why be afraid? If he is found innocent, then the justice system has done its duty and freed an innocent man. Second, why is the State of Montana so convinced of Barry’s guilt, yet afraid he might be found innocent? Has the State of Montana turned away from truth? There is no harm in seeking truth and in the case of Barry Beach, the truth will set him free. Our outrage is that the State of Montana is willing to go to any length to maintain a conviction even when that conviction is knowingly wrong. We fear a government that is willing to ignore truth and fact for the protection of their ego. We fear that our own rights and freedoms are at risk when this mentality is held by our elected officials. We demand truth and justice.